Our last post discussed Fr. 1133, the rare and desirable $1000 large size Federal Reserve Note. A few are up for sale from dealers. See the previous blog post below for further information. We recently received our periodical e-newsletter from Heritage Auctions, who will be handling this year’s 2011 September Long Beach Signature Currency Auction, slated for September 7-9 in Long Beach, California. There are ALREADY some fantastic notes up for sale, some of which don’t show up very often. If you’re hoping to consign notes to this auction, please do so right away: the cutoff date is July 23 and after that you’re up the creek. One note that caught our eye was the Fr. 1219e $1000 1907 Gold Certificate, graded by PCGS as Apparent Very Fine 25, with comments stating “Repaired Edge Tears at Right”. Upon closer inspection, there are indeed some tears surrounded by some discoloration, perhaps leftovers from whatever substance was used to restore the note. Regardless of whether you like your notes “original” or can tolerate the quirky “apparent” grade, this gold certificate is definitely a keeper. According to the PCGS population report 6 notes of this Friedberg type have been graded, while PMG reports a total of 13. A small portion of this group are “Apparent” (PCGS) or “Net” (PMG) for repairs. To say the least, these don’t come up for sale very often. The real question is, just what will it fetch, given the current state of the National economy? Will there be a bidding war for it or will one lone ranger cough up enough bread to take it home? Our guess is that it will sell for go for well over $100,000 USD. If you hold us to the wall 🙂 , the official PaperMoneyAuction.com guestimation is $175,000 USD. We make this guess given the fact that many small size Binion 10,000’s in CU condition are approaching $150,000 – $160,000 USD in prices offered by prominent dealers. 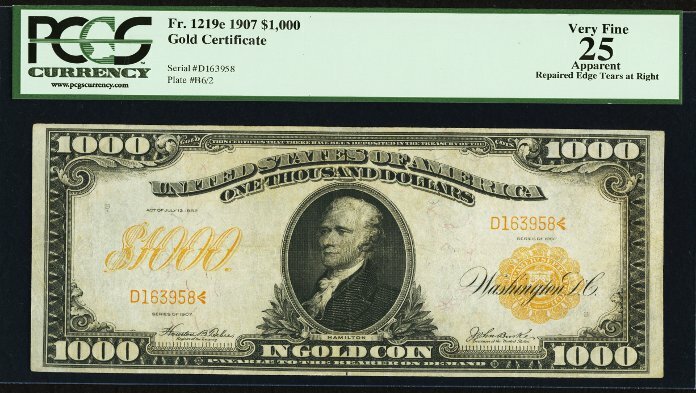 There are FAR less 1907 $1000 Gold Certificates, so the rarity itself commands a higher premium, even if this particular note has been repaired with a respectable Very Fine 25 grade. Stay tuned for Long Beach and keep your eye on this one: it will be a show-stopper for sure! (*PaperMoneyAuction.com is not associated nor affiliated with Heritage Auctions, and any trademarks, tradenames, or slogans respectively are copyrights of Heritage Auctions, INC).